There are countless HVAC contractors in Mokena. Some specialize in residential, while others stick to commercial. A handful only performs heating services, while others specialize in air conditioning. Here are Allegiance Heating & Cooling, we do it all. But how do you go about finding a local HVAC service that not only gets the job done but also respects your time and doesn’t try to sell you on anything you don’t need? 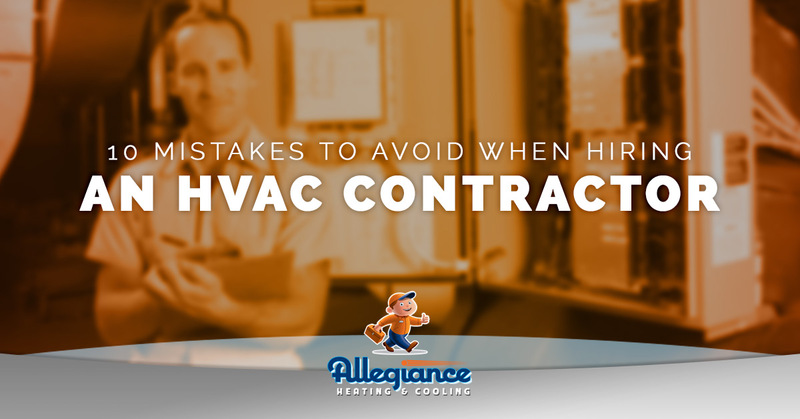 Here are 10 mistakes to avoid when hiring an HVAC repair company. Settling for one opinion – It never hurts to get more than one opinion when it comes to HVAC service. Make it a point to shop around and get multiple estimates. Doing so will help prevent someone from overcharging if they determine the situation is urgent. Assuming all HVAC repair experts are the same – As with any industry, there are plenty of fly-by-night contractors out there. Anyone can claim they have years of experience in the HVAC world. Don’t be fooled, though. At Allegiance, all of our technicians are NATE-certified. That means you get the absolute best service. Not asking for references – We can’t emphasize enough the importance of doing your homework when searching for the right HVAC professional. Good references will give you peace of mind in knowing the person you hire is the right one for the job. You can also go one step further and look up the company through the Better Business Bureau. Failing to check online reviews – Few companies have pristine reviews. That said, it’s pretty easy to identify a trend in what others are saying about their work. Opting for the cheapest option – You may be tempted to go with the cheapest price for HVAC service. However, that may not be a good idea. The last thing you want is to find out soon after receiving service that the issue hasn’t really been fixed. The reality is that you shouldn’t have to pay twice to have your heater or A/C unit corrected. If you get it right the first time, you won’t have to worry about it anymore. Choosing a company with poor response time – There’s nothing more frustrating than scheduling an entire day around a service call. At Allegiance, we realize the importance of your time. That’s why we’re committed to always arriving on time and completing work as quickly as possible. Our team understands the challenge of finding a reliable HVAC company. That’s why we keep our mission simple: Make sure that the customer is happy and that the work is done right. It may sound simple, but others fail to do it. When our technician is scheduled to come to your home, they will protect your flooring and furnishings with mats, tarps, and shoe booties. You can feel comfortable knowing that Allegiance always treats your property as if it were our own. Don’t stress over hiring the right HVAC service any longer. Call Allegiance today to request a quote.